There are certain events in the running calendar which take on an almost cult status: perhaps because of how challenging they are, the atmosphere surrounding them, or because of some other quirk which sets them aside from more “mainstream” events. In my eyes, one such race is Ashby 20, held annually in late March. 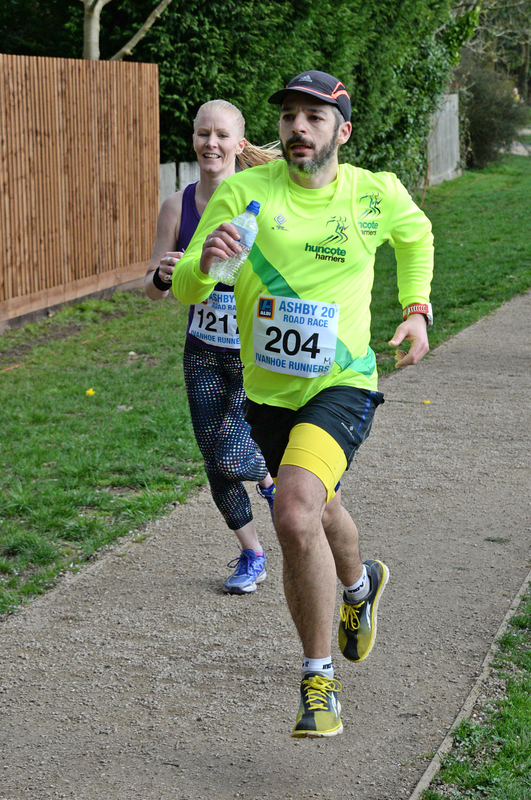 Its timing and length make it perfect for those training for a spring marathon, but that is almost an aside: I am sure that the vast majority of runners who book their places in record time would do so whether they were preparing for a marathon or not. For those who are not familiar with this event, it starts and finishes in the market town of Ashby-de-la-Zouch in Leicestershire and takes in two loops of scenic country roads through the villages of Packington, Swepstone, Heather and Normanton le Heath before turning back into Ashby for a spectacular finish on the Bath Grounds: spectacular mostly due to the number of spectators in the open area of the Grounds, their enthusiasm and the sight of other finishers already sporting their finishers’ hoodies. These hoodies (given out instead of the common t-shirt) are one of the traditions of the event, and their colour (which changes every year) is one of the closest guarded secrets of the sporting calendar! Other highlights of the race include a very active, friendly and engaging twitter feed, which gives the opportunity for great pre-and post- race banter and engagement, and the world’s best tasting cob (or at least so it seems after 20 miles on an “undulating” route!) included in the goodie bag! Munching on the cob, after the 2016 race. 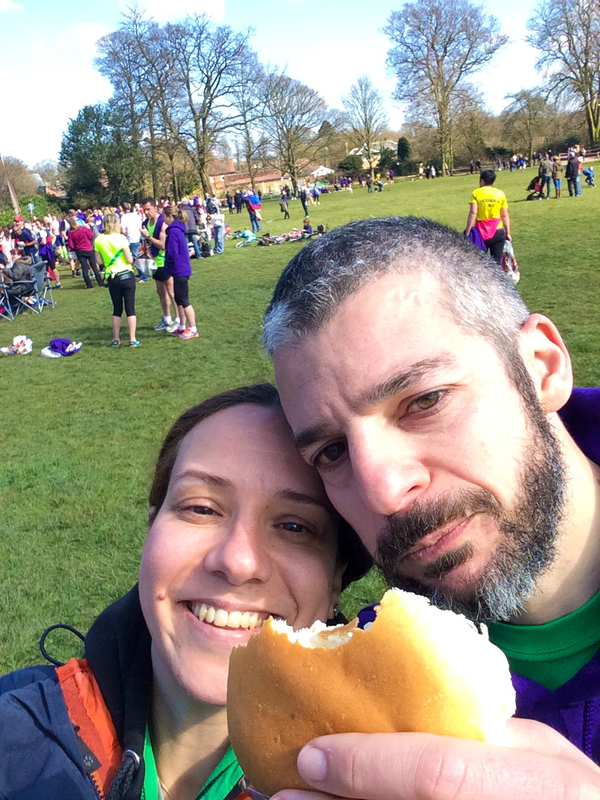 2017 was my fourth consecutive year running it, and as people who follow this blog will know, it was my main preparation race for this year’s London Marathon. I had mixed feelings of confidence (I had already ran two 20 milers in the past month, plus a long run with speed efforts, and this was only meant to be a training run) and nervousness: Ashby 20 is never an easy route and I have three years’ worth of memories of suffering on the second lap and the uphill return leg into Ashby! But soon enough we are at the start, and getting into position. It’s always interesting just before the race starts, observing other runners, their shoes (“I’ve heard about these, I wonder if they are any good”), their gadgets, how they decide to hydrate and fuel and the reasons that get them out: There was a runner just in front of me who had inscribed on the back of his t-shirt that he was running “in memory of baby Arthur”… It stops you in your tracks an inscription like that, makes you shudder at the story that must lie behind it and wonder whether it is appropriate to pat him on the shoulder and wish him strength in the race… Then the horn signalling the start of the race blew, and the moment passed in a frenzy of footsteps. Ashby isn’t only hilly: It is treacherous in its hilliness! The outward leg leading to the first loop proper is a lovely downhill section, tempting you into a fast pace which you then instinctively try to maintain at the start of the first lap, which then quickly turns uphill… I knew about this, and tried to judge my pace on feel rather than GPS, but that didn’t quite work either: Kyriakos is a faster runner than I, and it took me three miles before deciding to stop trying to keep up and concentrate on my race. Three miles is where the first water station is, and it was manned as if this was a major city marathon of c. 20,000 runners, and not a local affair of 1,500! This is the case for all water stations, marshals on the route and everyone involved in holding this event: for example baggage drop of takes place at two locations (outside the leisure centre and at the start assembly, for anyone wanting to wrap up warm till the last minute, or who – like I did – has managed to forget to drop his water bottle off with his rucksack and is now looking for a safe place to deposit it), and they are all gathered at the finish waiting to be handed over instantly and with hardly any queuing! The whole affair manages to combine the friendliness of a club run (it is organised by a local running club after all, Ivanhoe Runners) with the atmosphere of a village fête and the smooth organisation you would expect from an IAAF Diamond League event – less the doping allegations of course, and with the addition of a gorilla as a regular participant! It is no wonder then that BARR, who maintain road running standards for UK Athletics, awarded the 2017 Bill Reynolds Trophy to the Ashby 20 for ‘its excellent race organisation and continual improvement’ for last year’s event (the first time it introduced road closures for the safety and comfort of runners). I suppose this smooth organisation is assisted by the relatively small field (there are only 1,500 places and they sell out in a matter of hours! ), but I think that in this area the organisers have made the right decision: they have gradually been increasing the places in the past few years, but I appreciate the measured way in which they have done this, presumably to stop before the field grows too large for the event and the local infrastructure. But back to my race: passing the three mile point, I had settled in a nice pace, perhaps a touch faster than I would have liked, and trading places with a few runners as you tend to do in long events, especially when there are hills involved. I spent some time running with other Harriers coming through the field, but did the sensible thing and didn’t try to follow them if they proved faster. I was distracting myself by watching familiar landmarks go past and admiring the views to the left, towards the centre of the anti-clockwise loop. I recognised every uphill and downhill as I ran over them, knowing that the climb up to Heather would hurt much more the second time I ran it, and that the gentle hill at the end of the first loop would mutate into a never-ending slog the second time ran up it, testing our resolve and causing many runners to slow to a walk… I had the first time I ran Ashby as well, to be fair! I was disappointed at the drop in my pace: I know that I am not as fast as I had been two or three years ago, but as I mentioned a few times already, I had hoped that my speed endurance had improved from other years… This disappointment lingered and meant the final 6 miles were not particularly happy ones, especially as I was being overtaken more than I overtook… On the motorway bridge at mile 19 (unnecessary and wanton cruelty, if you ask me!) I decided I had had enough with such long races: Once London marathon was over, I declared, I would limit my races to half marathon distance! Which is an improvement, as last year I had forsaken all races over half marathon at the 17m point of the same race, so I seemed to have lasted 2 miles more! Morale did improve on the descent of that bridge and the closer we got to Ashby: I was stronger than I expected to be at that very end of the race under the circumstances, and while I was still been overtaken, I felt still part of the race as I sensed the finish line getting closer. Entering the final section, the footpath round Bath Grounds, I even felt I had a sprint finish in me, so I started building up pace with about 300m to go, overtook a few runners on the footpath and managed to nick another place a few yards before the finish! This push hardly made any difference to my time over the 20 mile distance of course, and photobombing someone else’s finish photo the way I did may seem a bit petty, but… It makes all the difference to my memory of the event, and after all I have been overtaken myself with a few meters to go (Joy Cann anyone? )… it’s annoying, but it’s all part of what a road race is! And by the tired smiles on both our faces, not only in the photos but when we exchanged compliments at the finish line, I think we both understand that: and I fully expect to be paid back in kind when I next meet this particular runner! Kyriakos had finished five minutes before me, and spotted me as I was collecting my goody bag. With both our families waiting for us at our respective homes, and in contrast to other years, we decided to head back as soon as our legs would respond to the “stand!” command… Baggage collection was extra fast, and the brilliant volunteers even found the water bottle I had given them separately! The only thing missing was the vendor of the protein smoothies we had enjoyed last year, a brilliant idea as its not only a perfect recovery drink, but also what you need to wash your cob down with! So with another Ashby done, the race bib joining the others in the draw and the Huncote vest in the laundry for it to be ready for London, what do I keep from Sunday morning? That I am gradually improving, but it’s taking its time and it will take a whole lot of effort: there is a long way to go yet before I can be where I was two or three years ago. And scarily, between where I am now and my two-year old performance lies my transition from Senior to Veteran category!.. Have I been as good as I’m ever going to be? On the other hand, this was my second best result on this course, and it has come in the wake of the happy turbulence of young Philip’s arrival, so I have to be pleased with that! And given the first half of the race was my fastest ever, there is the question of whether I could have done better overall if I had reigned myself in a bit to begin with… a lesson for London perhaps. But I think I will choose to remember 2017 Ashby as another lovely Sunday morning spent with hundreds of friends: runners, marshals, volunteers and spectators… No wonder I keep coming back to it every year! And by that final sprint! Because when you have been struggling for the last 6 miles of a 20 mile race, there is nothing like a meaningless dash to the line to restore your smile and salvage some faith in yourself! Next Post Ending March on a high!